Social Factory is our Joomla solution for a modern and dynamic social networking website that comes with a large area of configurable fields and features. 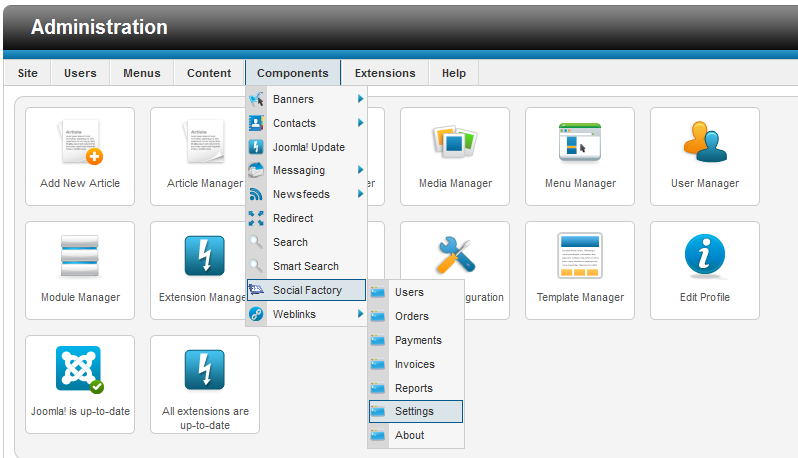 To edit some of them go to "Components/Social Factory/Settings" in the Joomla backend. In the General tab you have the basic component settings like date, notifications, plugins, etc. Firstly, you have the Date format and Full date format fields, one for the basic date and one for a full date which includes hours, minutes and seconds, change the formats as you wish. Enable Remove user if you wish to delete both the Joomla and the Social Factory profiles at the same time. 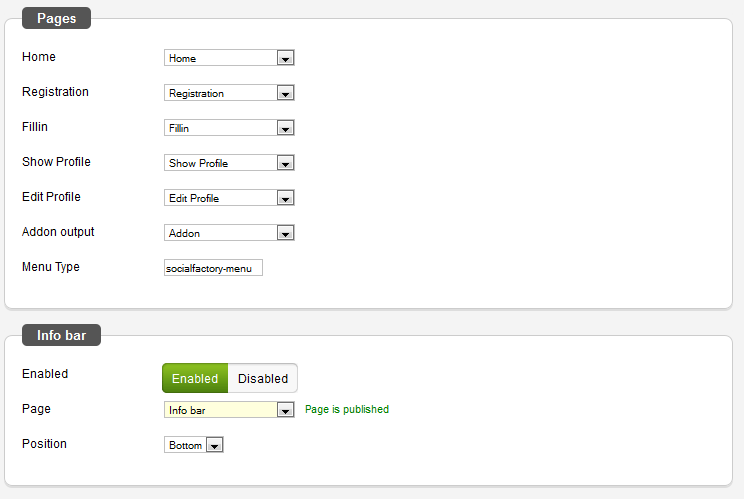 On the Backend user edit area you can choose an edit field layout for backend profile editing from your defined layouts. 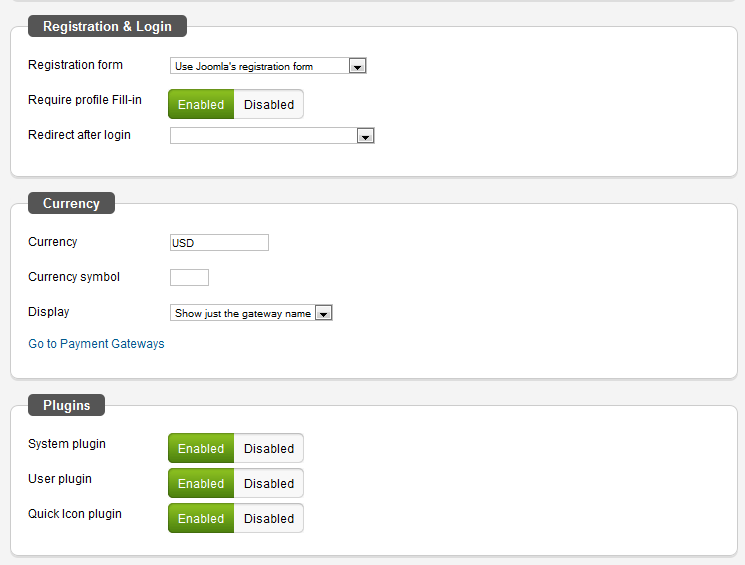 You can change the registration form between the Social Factory type and the standard Joomla type. If the registration is done through Joomla, you can enable the Require profile Fill-in option to force users to complete the Social Factory user profile before performing any actions in the component. Redirect after login allows you to select a page where the user will be redirected after logging in. In the Currency area you can chose which type of currency to be used, the symbol of it and how to be displayed, by logo or name. 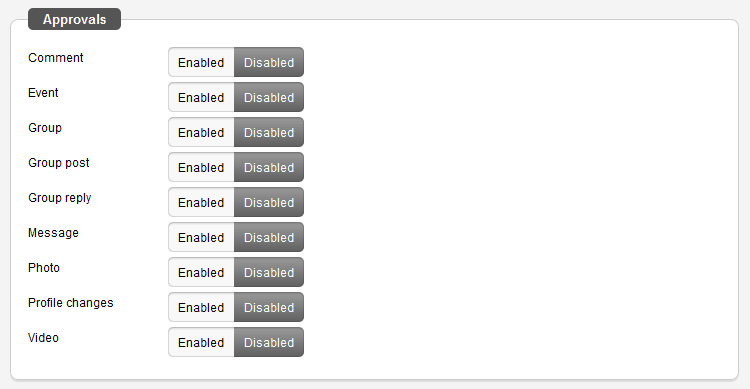 You can easily enable/disable the Joomla plugins needed for Social Factory. 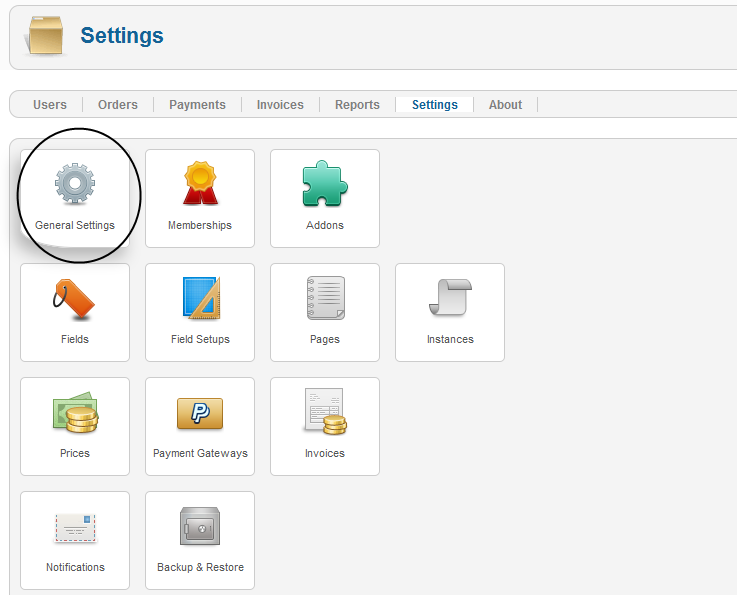 A quick icon is also present for quick access from the Joomla Dashboard. Below these you can set up the Info Bar. In the Approvals section you can enable which actions made by the users need admin approval before displaying them on the front end. If enabled after content was already published, that content will enter the approval queue and will no longer list until marked as approved. 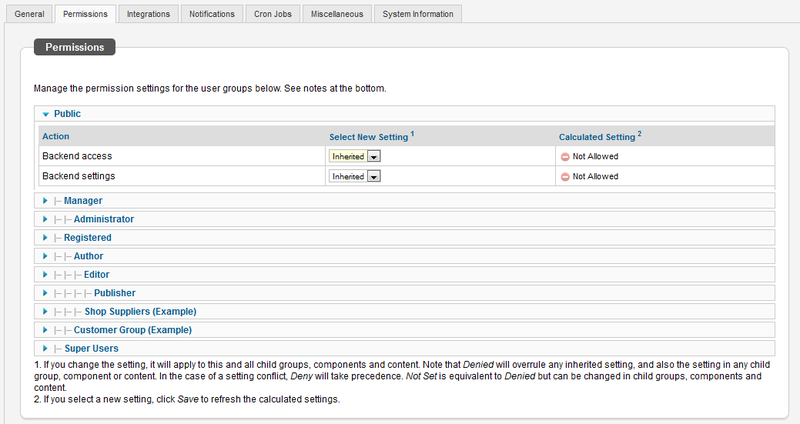 In the Permissions tab you can change the Joomla default permission settings for all user groups. You can change the permission from Inherited (Joomla's default) to Allowed or Denied. Social Factory comes with Google Maps and Facebook integration, to use the Google Map integration, enable it and add the API key. To find out how to obtain the API key visit their documentation. 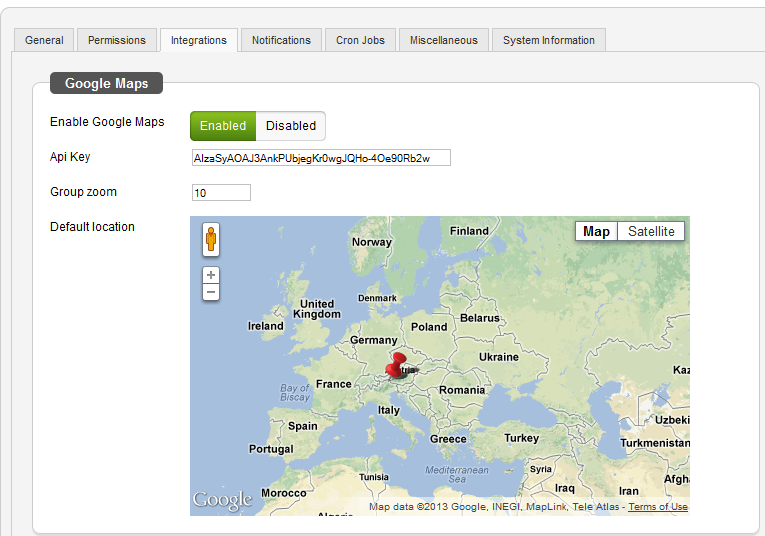 Here you can also add a group zoom value and set a default location for the map. You can enable Google maps location fields so that when users save their profiles, their position on the map updates automatically using the assigned location fields. 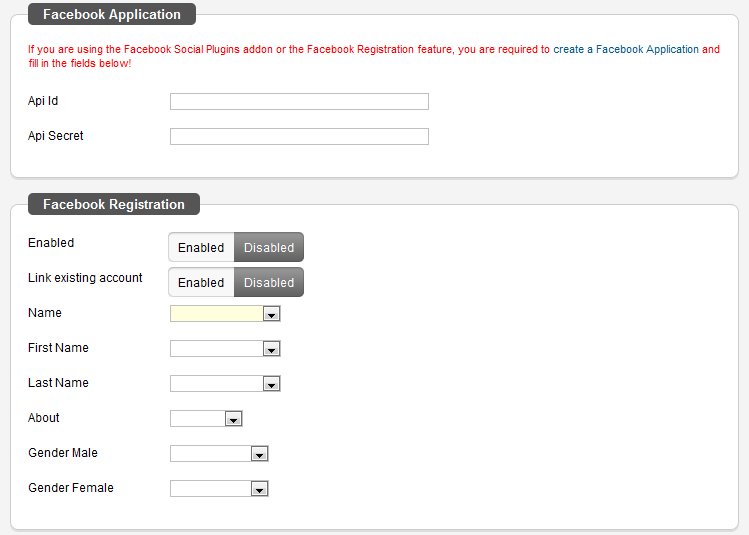 The Facebook integration allows users to register on the website using their Facebook account. If you want to enable this feature you will have to add an API Id and API secret key, to do that go to their website and follow the instructions for creating an app. Next step is to enable the plugin and assign the registration fields. 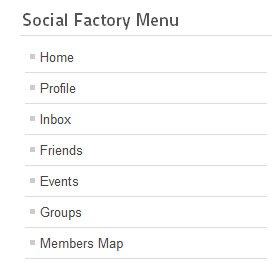 You can also allow users who already have a Social Factory account to link it with their Facebook account. On the Notifications tab you can enable or disable any email notification the system sends out. To modify the notification's text settings follow the link on the panel. 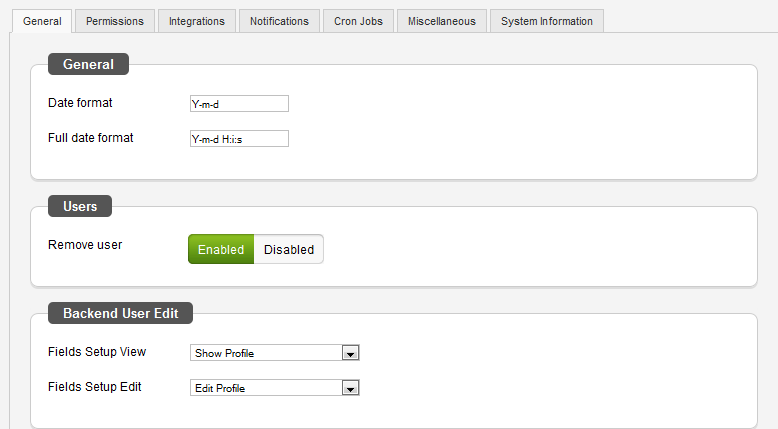 For specific system notifications and maintenance you can enable the Cron Job processing. The job must then be scheduled in your hosting panel. See our general CRON tutorial for detailed information and guidance. In the Miscellaneous tab you can manage the Backend Submenu by enabling or disabling it and modifying the content shown on it. 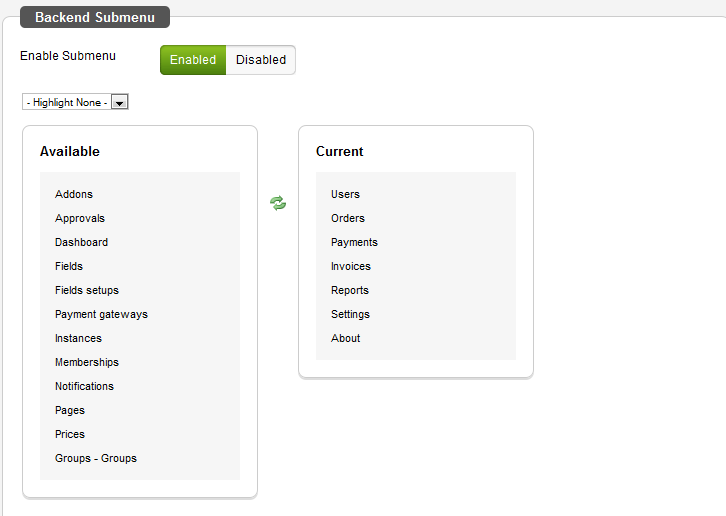 To customize the menu simply drag & drop the categories from one side to another and then save. You can also choose which jQuery Library to use for your site, set Enabled to use jQuery libraries from the Google CDN, or Disabled to use the local versions and choose a theme. Home - the place where you can check friends posts on their walls. Profile - where you can edit the profile, post on your wall, add photos and videos. Inbox - can view all the messages, interactions or invitations received. Friends - the place where you can check all your friends or search for new ones. Events - here you can search and create events. Groups - join or create new groups. Members Map - Google Maps integration that allows you to see all the users on it and search by location.